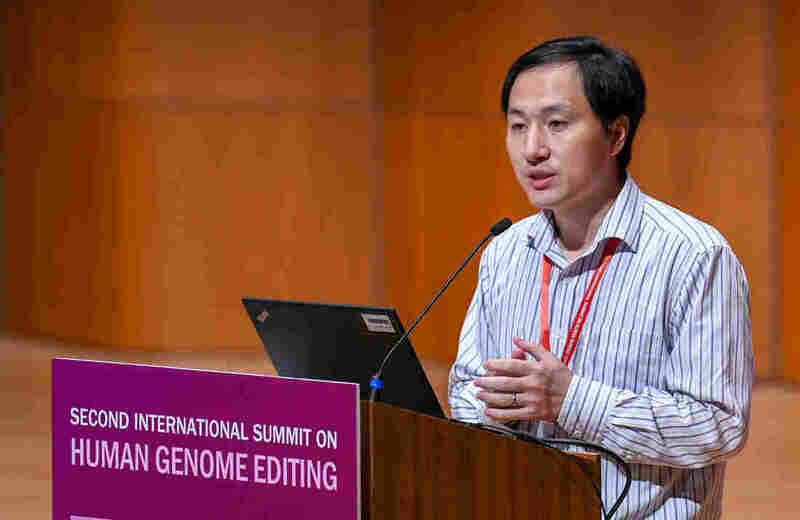 Standards Needed For Editing Of Human Germline : Shots - Health News U.S. National Academy of Medicine, U.S. National Academy of Sciences, and Chinese Academy of Sciences call for international gene-editing standards. Critics blast statement as inadequate. Scientist He Jiankui was criticized by colleagues after his claim to have created gene-edited babies became public. Three leading scientific organizations are calling for more controls. Three of the most influential scientific organizations in the world are calling for an urgent international effort to prevent scientists from creating any more gene-edited babies without proper approval and supervision. Global standards are needed quickly to ensure gene-editing of human embryos moves ahead safely and ethically, according to the presidents of the U.S. National Academy of Medicine, U.S. National Academy of Sciences and the Chinese Academy of Sciences. "To maintain the public's trust that someday genome editing will be able to treat or prevent disease, the research community needs to take steps now to demonstrate that this new tool can be applied with competence, integrity, and benevolence," the three presidents — Victor Dzau, Marcia McNutt, and Chunli Bai — wrote in an unusual editorial published Thursday in the journal Science. The editorial is headlined: "Wake-up call from Hong Kong." It was prompted by the Chinese scientist who stunned the world by claiming that he had created twin girls from embryos whose DNA he had edited in his lab. He Jiankui, of the Southern University of Science and Technology in Shenzhen, China, claims he was trying to protect the girls from the AIDS virus. But his claim that he had created gene-edited babies using the technique known as CRISPR was widely condemned as dangerously premature and unethical. Some scientists welcomed the statement from the academies as another important step to rein in dangers posed by powerful new gene-editing techniques without hindering their potential to prevent suffering. But the statement drew harsh criticism from other scientists, as well as some bioethicists and activists, some of whom are calling for a moratorium on pregnancies using gene-edited human embryos. Critics charge the statement published Thursday is just the latest in a series of weak and misguided attempts by the scientific community to police itself. "I find the views expressed in this editorial perplexing, dismaying and highly problematic," wrote J. Benjamin Hurlbut, a bioethicist at Arizona State University, in an email. "Why just because one person has crossed a line is it urgent to 'reach international agreement' on how that line should be crossed next time? Isn't the right question whether it should be crossed?" Other critics worried it would encourage rogue scientists. "This commentary is a breathtakingly shameless effort to turn He Jiankui's reckless experiment into a green light for forging ahead with human germline modification," Marcy Darnovsky, who heads the Center for Genetics and Society, wrote in an email. "Rather than recognizing the need for extreme caution and widespread consultation about whether to alter the genes of future children and generations, the authors propose to put themselves and their colleagues in charge of deciding how to proceed," Darnovsky wrote. But the editorial found support among some leading researchers. "I think it's a thoughtful statement that highlights the importance of further deliberation," wrote George Daley, dean of the Harvard Medical School, in an email. Daley helped organize the Second International Summit on Human Genome Editing, where He made his claims. The summit condemned He's experiment, but rejected calls for a moratorium on research into gene-edited babies. Instead, the organizers called for developing a "pathway" for how scientists might someday safely and ethically create gene-edited babies to prevent devastating genetic diseases. Daley said the editorial "clarified" the summit's position by stating "what is needed is further deliberation on the scientific hurdles to be surmounted before considering any clinical use, as well as broader societal debate to determine which diseases or conditions—if any—might be deemed permissible." Daley wrote, "Unless and until such high standards are met, conducting germline gene editing would be premature and irresponsible." The director of the U.S. National Institutes of Health, Francis Collins, said that he also welcomed the editorial. "As all of us continue to wrestle with effective international mechanisms to prevent future irresponsible uses of gene editing for the human germline, I welcome the joint statement from the leadership of the United States and Chinese Academies," Collins wrote in a statement. Some scientists have questioned the need to pursue gene-editing techniques such as CRISPR when there are safer, far less drastic alternatives to prevent most diseases. "There is zero clinical rationale for embryo editing aimed at producing edited babies. The simplest path forward is to ban it," wrote Fyodor Urnov of the Altius Institute for Biomedical Sciences in Seattle in an email. Urnov noted that the U.S academies "did precisely what they are calling for here" three years ago. "How well did that work?" "Mixed messages like from this year's meeting, where some organizers are surprisingly gung-ho on the idea of CRISPR babies in the future, aren't going to help or keep up with the reality on the ground," wrote Paul Knoepfler of the University of California, Davis, in an email. David Liu of the Broad Institute in Cambridge, Mass., would also "go further and suggest a formal moratorium on initiating human pregnancies from genome-editing embryos until steps are implemented that would make extremely unlikely a repeat of the recent case," he wrote in an email. Hank Greely, a bioethicist at Stanford University, said a broad consensus is crucial before anyone tries to create more gene-edited babies. "Science must be, and is, subordinate to its societies," Greeley wrote. "At a time when people are worried about whether science is out of control, it needs to say that, up front and loud." Dzau, the U.S. National Academy of Medicine president, defended the editorial during an interview with NPR. "If we're not careful, the science may have harmful effects. But I think most would agree the science is going to be enormously helpful to humanity. So an outright ban is not the way to do it," Dzau says. "The problem with the outright ban is that it casts this huge dark cloud over the science." The editorial calls "upon international academies to quickly convene international experts and stakeholders to produce an expedited report that will inform the development of those criteria and standards to which all genome editing in human embryos for reproductive purposes must conform." That is crucial to "avoid the potential for researchers to rationalize the justification or seek out convenient locales for conducting dangerous and unethical experimentation," they wrote. The editorial also calls for "an international mechanism that would enable scientists to raise concerns about cases of research that are not conforming to the accept principles or standards."